Seoul has several small and large traditional markets, ranging from markets with a long history of 100 years to markets that offer many things to see such as a medicine market and pungmul markets. Gwangjang Market has been situated in the center of Seoul for more than 100 years. The market was started with the establishment of Gwangjang Co. in order to restore Korea’s national sovereignty, which was lost due to the Japanese invasion of Korea in 1905. Silks and satin, linen and cotton, women’s clothing, bedding, and handcraft items are sold here. Import stores are frequented by young people who want vintage fashions. Dongdaemun Market began as the largest market in the East in December 1970, and has been for more than 40 years. It has now grown to be a famous international fashion place and is frequented by many tourists. It sells fabric, clothing materials, accessories, and wedding goods at wholesale and retail prices. The sale of fabric at Dongdaemun Market accounts for 80% of the total fabric trade in Korea. Even though several new high-rise shopping malls are being built around Dongdaemun, which is the main eastern gate of the old city wall, visitors can still experience the charm of this traditional market. Namdaemun Market is Korea’s largest and oldest traditional market, which is visited by 500,000 people daily. Most of the products traded at the market are directly produced and sold by merchants. Every night, merchants from all over the nation flock to the market, and in the morning, the market comes alive again when local consumers come to the market. Many tourists come to the market as well to experience a traditional Korean market. 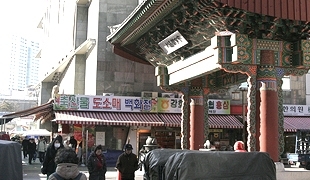 In 2008, the Seoul Folk Flea Market was opened near Cheonggyecheon Stream. The market sells folk items, daily essentials, souvenirs, traditional goods, and food, which allows visitors to enjoy shopping and eating all under one roof. The market is divided into seven zones that are marked with the colors of the rainbow, such as red, orange, yellow, green, blue, indigo, and purple. The red zone is a food court. The orange zone sells local specialty produce, crafts, and decorative stones. The yellow zone sells vintage goods such as typewriters and telephones. The green zone sells antiques such as traditional antique furniture and art. The blue zone sells fashion accessories, paintings, calligraphic works, and hanji (Korean traditional paper). The purple zone sells miscellaneous goods, electronics, and tools. The Noryangjin Fisheries Wholesale Market is the best place in downtown Seoul to get fresh seafood. It is located near Noryangjin Station of Subway Line No. 1. All kinds of live seafood, which are fresh from the sea, area available in abundance. During lunchtime, dinnertime, and late at night, the market is bustling with customers who try to get fresh seafood at good prices. Yangnyeong Market has been designated as a specialized medicinal herb industry zone. The market was formed in the late 1960s as herbal shops started to flock to the current market place one by one. Along with economic development, the market has qualitatively and quantitatively grown bigger. Consumers can get hard-to-find medicinal materials such as frogs, terrapins, and freshwater shrimp, which are used as folk remedies, from this market. The market sells cactus fruits, cockscomb seeds, corn silk, and mulberry roots at affordable prices as well. Customers can get herbal tea packaged in convenient plastic pouches by simply paying 10,000 won as a fee to an herbal processing shop. It takes about 3 hours to make these tea pouches. At the ginseng market, customers can buy fresh ginseng, red ginseng, fine ginseng roots, and a variety of honey, as well as Korean yeongji mushroom.